Google is having another go at a TV platform, undeterred by the spectacularly unsuccessful flops it's previously inflicted on the market. This time around, though, everything could be different - the software, hardware and digital entertainment landscape as a whole have shifted significantly in the last couple of years. Services like Netflix and devices like the Chromecast have put the traditional cable box under greater threat than ever - though with Sky and Virgin Media adding Wi-Fi support to their set-top boxes, the old distinctions aren't as clear as they used to be. 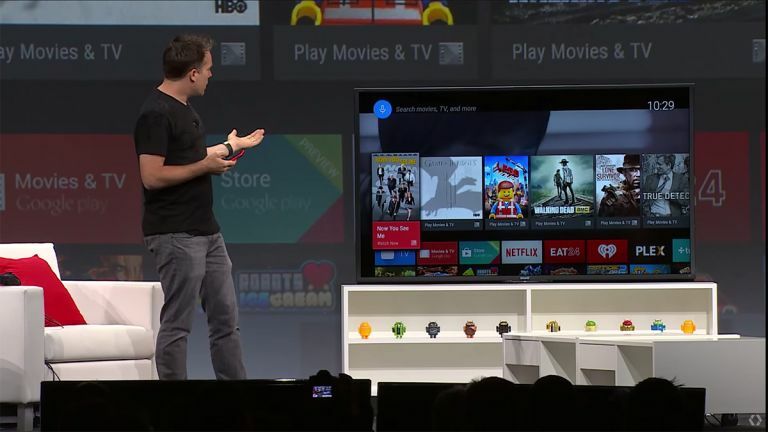 Here's why we think Android TV is set to be a success. Having the world's best media operating system is no use if it doesn't appear on any hardware, but it looks like the major manufacturers are behind Google's latest push for the living room. Then there's the Nexus Player, which seems to be everything that a lightweight set-top box should be and a genuine Android rival to the Apple TV. It's available in the UK as well as the US. You can search through the interface (and the web) using your voice, and it's Google Cast compatible too, so you can fling content at it from your smartphone or tablet. The likes of Sony, Philips and Sharp have announced television sets running Android TV, so even if you don't have a Nexus Player you can take advantage of the platform on other kit. It has to be a better option than the rather clunky and sluggish interfaces previous pre-installed on many smart TVs (and cable boxes). The most significant recent update to Android TV has been better support for apps on the platform - and as Windows Phone has proved, app support is crucial in pushing devices towards mainstream use. The likes of Netflix, Buzzfeed Video, Vevo, Sky News, Plex, VLC, DailyMotion, TED and TuneIn Radio are all present and correct, and Google says there are now 600 compatible apps on Google Play. There's still work to do, of course, before the experience is as good as it is on your phone, and live TV is an obvious gap, but it's a good start. What's more, recent software tweaks mean the apps are easier to find on Google Play: they're now split up into collections such as movies, sport, news and games, so you can more easily find what you're after. Since the ill-fated Google TV failed to make a mark on the television market, the landscape has shifted significantly. With every passing year we're all getting more comfortable with watching TV over the internet rather than through an aerial, and the big broadcasters in the industry are slowly coming around to the idea as well (consider US giant HBO, which now offers some web-only streaming services). Against that backdrop, Android TV has a much better chance of catching on and (eventually) replacing your cable box altogether - though you might well find an app from Sky, Virgin Media or BT appearing on Google's new platform. Now that all the major broadcasters have some kind of over-the-web platform in place, all Android TV has to do is tap into it (once the relevant licensing deals have been signed...). For a long time now, Google has been trying to make Android look good on a variety of different screen sizes, but Lollipop is the first version of the OS to really manage it. That's largely down to the stylish 'material design' principles that Google laid down for Lollipop apps, and a growing awareness of larger screen sizes among developers. The bottom line is that Android TV looks and works like something that's designed for a television set, and that can make all the difference for viewers sat on their sofas. There's a bunch of useful options and tools built into the software too, including a personalised recommendation system that highlights the movies, shows and music you're going to be most interested in based on what you've watched (and liked) before. No one on the Xbox One or Sony PlayStation 4 teams is going to be worried by the gaming power of the Android TV kit currently on the market, but for casual gamers who just want to while away a few minutes in front of the TV it fits the bill. Playing on a smartphone or tablet is one thing but a 40-inch display is something else, and it's another reason for punters to opt for an Android TV box over the competition. It's also another reason for hardware partners to get involved with building Android TV kit. Take the Nvidia Shield, for example, which comes with a gamepad so you can jump right in to your big-screen Android gaming experience. Read more: is Nvidia releasing a Pro version of its Android TV Shield Console?